Producer Michael Beinhorn discussed working with legendary Black Sabbath frontman Ozzy Osbourne in a new Eon Music interview. Moving on, and in 1995 you worked on Ozzy Osbourne's 'Ozzmosis' album - was it a struggle to get that one down? "It took a long time [*laughing*]. It took a long time trying out some of the material for it, and I also worked Ozzy's record in the middle of someone else's record. It took months to assemble all the material for it and to coordinate everything. It was definitely a movie, and I remember we were looking at studios and Ozzy called up and he told me all the studios he didn't want to work in, and then he hung the phone up! [*laughing*]. We wound up tracking the record in a studio in Paris, and it was a long, drawn out process." You had Ozzy, Zakk Wylde, Geezer Butler and Rick Wakeman on there; does it go to show that even with the right ingredients, it doesn't necessarily lead to a great album? It's funny because you can work as hard as you can, and you can put as much intent and as much effort into something as you possibly can, but if the stars aren't aligning and everyone isn't on the same page? You really need to have so many things heading in the same direction in order for something like that to work. I'm certainly very grateful that the record was a [commercial] success. Unfortunately a lot got lost in translation too. I'd recorded it a certain way; I had come up with this two inch eight track analogue recording system that no one had ever used before, and I tracked the drums on it, and unfortunately when it was mixed, the guy who was mixing it didn't really know how to work with it. He lost all the subtleties and the depth of the drum kit, so that part of it was kind of heart breaking. It sounds like it was a completely different recording experience to [Soundgarden's] 'Superunknown' the year before. "Well, it's hard to describe it exactly. Comparatively speaking, on a record like 'Superunkown', there was just an energy about it, like, I can't really describe it. It was one of these things where you just knew that this thing was going to happen no matter what; like we were all just pawns it in. I could say; "Oh, I did this, I did that", but the fact is that we were really just being drawn along by some other kind of force or energy or whatever, that took the whole project to its inevitable conclusion. To me, that's the best that you could hope for when you have a recording project. Ozzy's record? Not so much. He's not much of a participant, or at least he wasn't on that record. He kind of left us to our own devices. It was me and the other musicians, and I think when you've got a record that is basically by a solo artist, it's a little more difficult if the solo artist isn't really heavily involved in the creative process." Tommy Aldridge was recently interviewed by Miles Schuman about working with Ozzy Osbourne, as transcribed by Blabbermouth. Tommy: "I was living in England at the time, and I was working with Gary Moore, who was signed to Jet Records, who ultimately signed Ozzy. That was kind of the connection." Tommy: "It scared me to death. It was inspirational. It was life-changing, not only from a musician standpoint... the first time I met Randy, he came to a rehearsal when I was rehearsing with Gary. He was a big Gary Moore fan, as most Les Paul players are, I think. He came to our rehearsal, and that's when I met him. He was really in awe of Gary, and Gary's tone." Tommy: "It was very exciting. From a musical perspective, it was probably the high-water mark of my career. Working with people like Randy Rhoads, guys like that, they kind of grab you by the scruff of your neck and lift you up to their level." Tommy: "I felt... not an obligation. 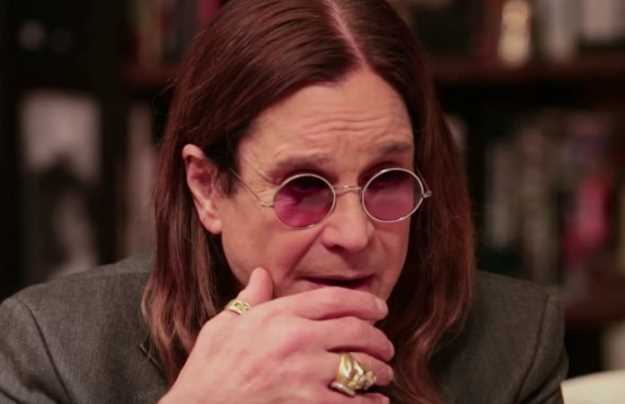 I just... sitting down with Sharon [Osbourne] and Ozzy, there was some momentum that they were trying to maintain, and I kind of took on the hat of the search of trying to find someone - not to take Randy's place, because unlike most people, I don't believe that everyone is replaceable. I don't think any person is replaceable, really, because we're each individual entities and only we can deliver the message that we were put here to deliver. Randy proved that in a billion, billion ways - he just wasn't replaceable - but I was trying to find someone that would meet those mandates that we had, and trying to maintain the momentum. I was trying to help Sharon and Ozzy out, trying to find someone, so I was flying around like crazy auditioning guitar players... We eventually found Jake [E. Lee]. We got Brad Gillis in to finish those shows, and there was another gentleman by the name of Bernie Torme, who was a British Strat cat. Awesome guitar player, and really, really cool, but the exact opposite of Randy. Randy was a really heavy, Les Paul cat. I remember that the first show he did was at Madison Square Garden, and I've never seen an organism as nervous... He had the weight of the world on his shoulders, coming in [with] the first gig [at] Madison Square Garden. You're going to be nervous if you're really well-rehearsed. I really, really felt for him, but he soldiered on. He came up later and he said, 'I just can't do this. It's too much.' He was really sweet to come in, but we got Brad in, and he was able to do the dates and do the tour with some aplomb, and honor as much as anyone can who Randy was... It was more me just trying to fill the void and trying to help out and trying to just do what I thought was the right thing."